A to Z Appliance Repair. Appliance Repair Service in Denver Metro, Colorado. 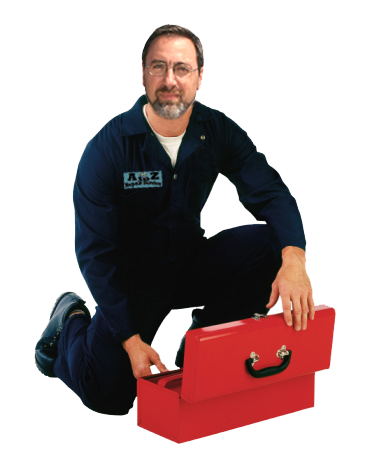 A to Z Repair Service was established more than 10 years ago. We have the experience required to give you confidence that your job will be done right the first time, every time! We specialize in all major home appliance repairs and services such as Washers, Dryers, Stoves, Ovens, Dishwashers, Garbage Disposals, Refrigerators and Ice makers. We service the Denver Metro and Surrounding Areas. 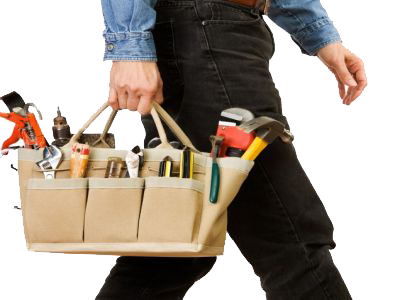 We can repair all leading brands and have the very experienced professional technicians who provide our customers with the best quality of service and work.. When you schedule an appointment with us you will always get a complete estimate that includes all charges required to get your appliances back into tip top shape. Our technicians are usually able to provide you with life expectancy, preventative measures as well as periodic maintenance tips that may help you decide whether or not to proceed with a repair. Technicians never add diagnosis fees, hourly rates, or travel charges. If you decide not to have your appliance repaired, you pay only our low service call for the trip to your home and the written estimate! Try our service and very reasonable rates one time and we promise that than we will the company of your choice forever! We believe that the greatest gratitude our technicians can receive is a customer’s satisfaction! Refrigerators are one of the most if not the most important appliance in your kitchen. If you have noticed a leak, your food is too cold or not cold enough, your ice maker is malfunctioning or emanating a strange noise then give us a call. We are able to diagnose any such problem and remedy them quickly. The lack of ice for your favorite beverage can be extremely frustrating and unnecessary hassle. If you have noticed your Ice Maker is leaking or your ice is not completely frozen then give AtoZ Repair Service a call and allow us to restore you and your families sense of sanity and mitigate any future frustration. When either your Stove or Range has been acting up and thus becoming unreliable, we know better than anyone how crucial it is for the problem to be remedied swiftly and proficiently. When hungry folks are waiting for food, such problems tend to be beyond bothersome. If the burners are working improperly, the display is malfunctioning or you are experiencing any other challenges, allow us to unburden you. If you have noticed that your Dishwasher is leaking, drying inconsistently or your dishes are not coming out as clean as they once were, give “A to Z Repair Service” a call before your next dinner party. Don’t take the chance of a spotted glass or silverware getting into the hands of those you care about! It seems that Washing Machines break at the most inopportune times and always when clean clothes are an immediate necessity. If you have witnessed your washer leaking onto the floor or failing to drain properly then we are there to help. 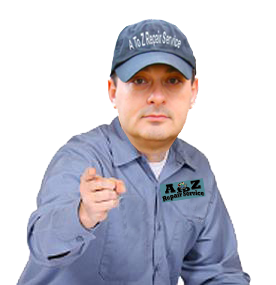 Give AtoZ Repair Service a call, we will be happy to service your appliance at your convenience and keep in mind that the service call is free with repairs. It seems that Dyers always break down when you have a wet load of clothes ready to put inside. With AtoZ Repair Service’s same day and emergency service that no longer means you or your clothes need to suffer the effects. If you have noticed your dryer has a squeak, emitting a strange noise or odor, or your clothes are not dryer to your satisfaction contact us immediately. Give us a call immediately and we will be right out to help!